In today’s post, I’m sort of getting the cart before the horse. lol Yesterday I posted a table setting for Tablescape Thursday here in my breakfast area. In that post I shared this photo. I liked the contrast viewing the all white, serene table setting juxtaposed against the colorful, red plaid shade of a lamp I had just added to the kitchen. That picture sparked a good many questions and emails asking about the lamp, so though I had planned on posting about it next week (after I share the porch where I first saw it) I thought I’d go ahead and share it today since there was so much interest in it yesterday and since I know they will not last long in the stores. 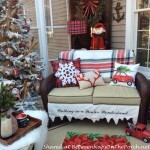 Recently, Linda, whose porch I’ve shared here on the blog before, sent me photos of her beautiful porch all decorated for Christmas. I’ll be sharing that reveal on Monday. In her photos I immediately spotted two of these awesome lamps. Linda told me they were from HomeGoods, a wonderful gift from her daughter. Hold the phone! I immediately called the closest HomeGoods to me, which is about 2 miles away, and asked if they had them in. They did! It was about 9 or 9:30 at night but I knew HomeGoods stays open later this time of year so off I dashed in search of tartan, pine cone lamps! They had four and I put two into my buggy. While I was there, I decided to check out some of the other holiday goodies. As I walked around the store pushing my buggy at 10:00 at night, I had two separate ladies come up to me and exclaim over these lamps! They loved them and wanted to know where in the store I had found them. They had the same excited reaction I had upon seeing them. My HomeGoods is also a TJ Max. I don’t know if the TJ Max stores got any of these in or not, but if your HomeGoods doesn’t have one, you may want to check TJs. They are very reasonably priced at $39.99 so again, I know they won’t be around long. I ended up just buying one. It was so late by the time I left, I figured if I got home and realized I had a good spot to use two, I could go back the following morning and pick up another one. In the end, I decided one was all I needed. When I got home, I walked around the house checking out various places it might work. The plaid in the lamp is red and navy, but the navy looks black when it’s lit up. 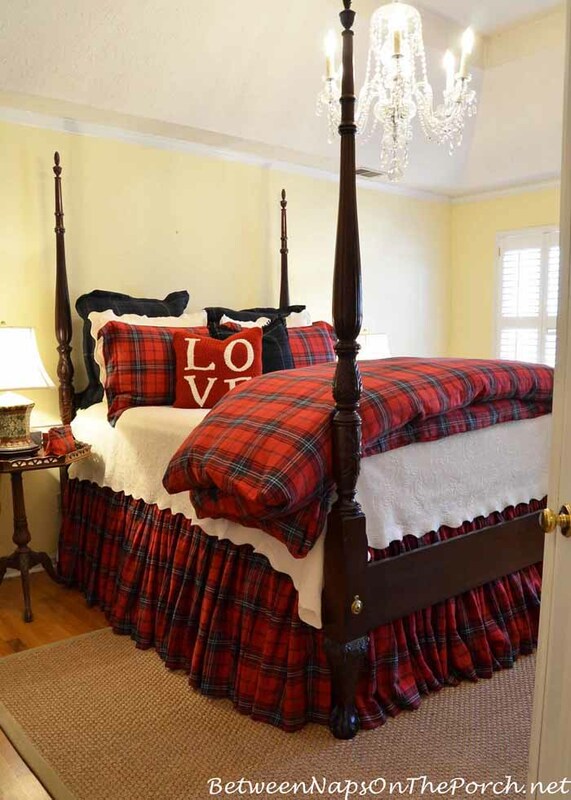 If the plaid pattern had been in red and dark green like my duvet, I would have considered placing one here in the bedroom on the table between the windows as an accent lamp during the fall and winter. 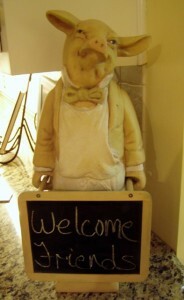 But ultimately the place I liked it best was here in the kitchen. I have red accents already in the kitchen with a red tea kettle and a red Kitchenaid mixer. I also have a red rooster that I sometimes place on the counter, so the red plaid works great here. I like how the red shade looks with the vintage Spode Tower dishware stored in the cabinets above it. That was a happy accident. The only small negative I found about these lamps is they didn’t do a very good job of matching up the plaid fabric where it meets. I’m a stickler about patterns matching up in my clothing. Out of the four lamps I saw, this one lined up the best. If you buy one of these lamps and your lamp will end up against a wall, it won’t really matter since no one will ever see if the plaid doesn’t quite match up. It’s not very noticeable here in the kitchen since the lamp backs up to the cabinets. And, let’s not forget, this lamp is only $40! I can make-do with a little mismatching to get a beautiful lamp for that price. Here’s how it looks at night with my under-cabinet lighting on, except the kitchen doesn’t feel this dark. The under-cabinet lighting was fooling my camera. And her’s how it looks with under-cabinet lighting off. One thing I really like about having a lamp here (other than how it looks) is that it’s giving my under-cabinet lighting a break. I usually have the under-cabinet lighting on a lot in the evening because I absolutely do not like overhead lighting. 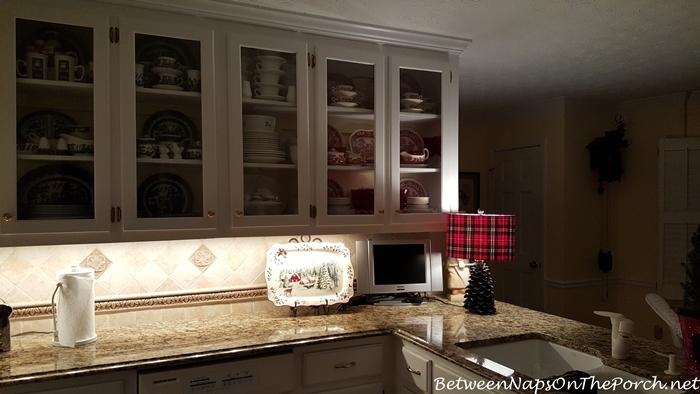 But the lamp cozies up the kitchen so much that I leave it on in the evening instead of the under-cabinet lighting, unless of course, I’m working at the counter. I’ve been hoping to add a lamp to my counter for some time. I’ve always loved that look because it makes a kitchen feel like another beautiful room in your home and not just a place where you cook and clean up. You may remember this kitchen that I shared in this previous post: A French Country Cottage with a Dream Kitchen. I loved how they used lamps in this space. 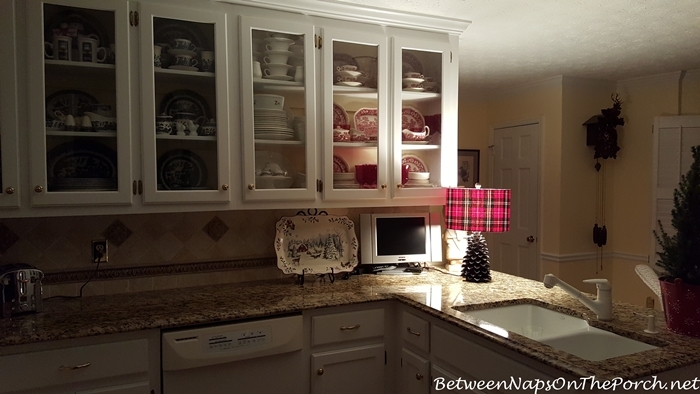 Lamplight is always so inviting and it makes pretty good task lighting in the kitchen, as well. I hope this answers any questions folks had about this lamp. Again, if you want one, call or visit your local HomeGoods as soon as you can because I’m telling ya now, they aren’t gonna last. I wish HomeGoods, TJ Max and Marshalls would get in more stock of the items they carry, but they never do. I hope everyone who wants one, gets one! After All That Garage Dish Storage, What’s Left Inside? That lamp is so adorable. I’m hearing Homegoods calling my name- for about the fourth time this week. Yikes! Mismatched seams bother me too and I’m wondering if a little hot glue and adding 2 or 3 black frogs or maybe some jcrew-like leather toggles from Dritz would fool the eye? Oh, I can see that Patricia…that would be a really nice finishing look to the back. 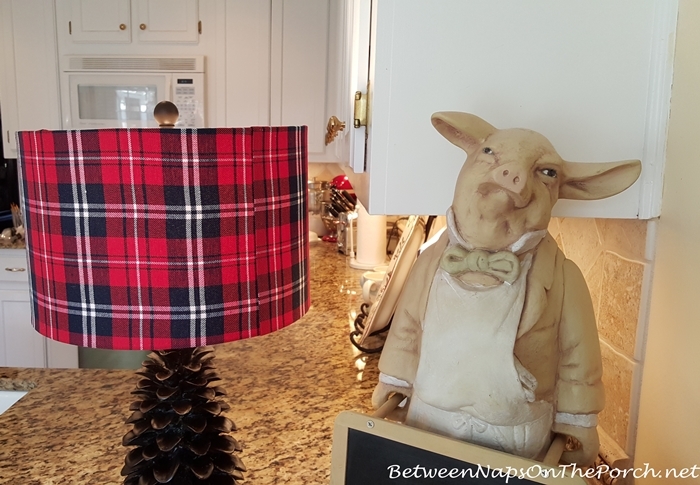 You know I love tartan plaid, and this lamp is so holiday perfect…great find! Love this lamp in your kitchen but more that I love the way your counter tops are all cleared off. I have so much stuff for getting ready to cook there is no room for a lampI always enjoy your posts, you are one energetic decorator!! Merry Christmas, thanks for all the inspiration. Debbie, mine get messy and cluttered sometimes, but then I have to do a clean sweep. Adding the lamp motivated me to clear off some of the things that had found their way to the counter. Merry Christmas to you! 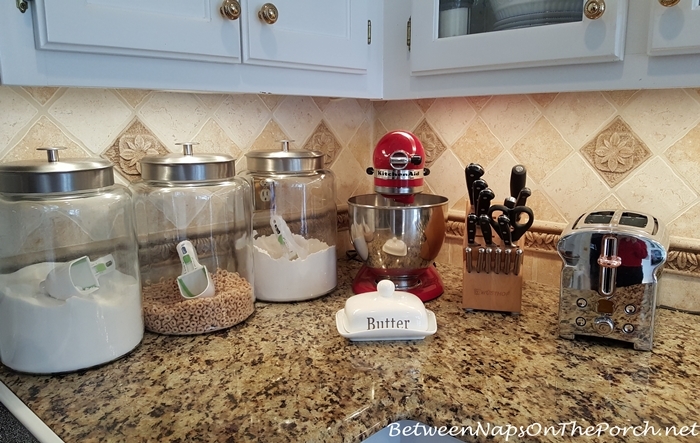 Love this lamp and love lamps in the kitchen too! Thanks for the heads up! Susan, I think my comment vanished! Love that you found one for yourself. I’ll make a stop and see if our HG has any. I have a vintage French lamp with a tartan shade. Think I’ll move it to our breakfast room for the holidays. Can’t ever have too much tartan! I was one of the people asking and THANK YOU for getting right back to me. I will call my HG!! Hope they have one for you, Pinky! I have a serious problem with lamps…..I will be on the search after 5pm today! lol Robyn, we are kindred spirits then. I love lamps! They so transform the feel of room when they are on. Hope you found one! That lamp is adorable,can’t wait to see if they have one,if not i’ll just cover a shade i have and use another lamp,but i do love that pine cone lamp. Love the lamp…thinking I need to head to Homegoods tomorrow. Love it more because it’s a pinecone base. I’m a into the whole natural/nature looking theme…or as the hub calls it my yearning log cabinism…Lol. And I know where you got that plate from….Did you get all the smaller dessert plates too? I couldn’t resist them!!! Ha…I have to remember that, “yearning log cabinism.” I think I have it, too. 🙂 I would love a cozy cabin in the mountains to decorate. I fell in love with cabins after I saw Charles Faudree’s cabin in Traditional Home magazine. Yep, I’ve collected a few of the salad plates each year. They keep coming out with new salad plate designs, so I always pick up a few of the new designs. It must have been a big seller for them since they have continued to produce it. I keep thinking if I keep decorating like I’m living in one then one day one with just drop around me….I’ve wanted a cabin like forever. On a lake in the woods or in the mountains out west. I’d be very very comfortable living in the Ponderosa…..I’ll have to google Charles Faudree. Seems the cabin/western theme is popular. Was at kohls today, think I took more pics of the Chaps line(Ralph Lauren) household & clothes than I did shopping…. I absolutely love that little lamp. It’s times like these I wish I lived closer to a big shopping area. It’s 60 miles to the nearest Home Goods. How I love that store! I wish they had a shop online, would be so convenient for folks who don’t live near one. You did get a good one….I saw one that had the plaid evenly positioned on the shade but the other three the fabric was put on crooked and it was terribly noticeable around the bottom of the shade….I stood back and looked and looked again and then looked again and decided it looked like I tried to glue the fabric on myself….I love where you put it….it looks great! Yeah, I saw some like that, too. Makes you wonder what they were thinking that they left it that way. Maybe a machine puts it on there and so they don’t notice it until it’s too late. Thanks, Sue! Great find….I LOVE the lamp!!! 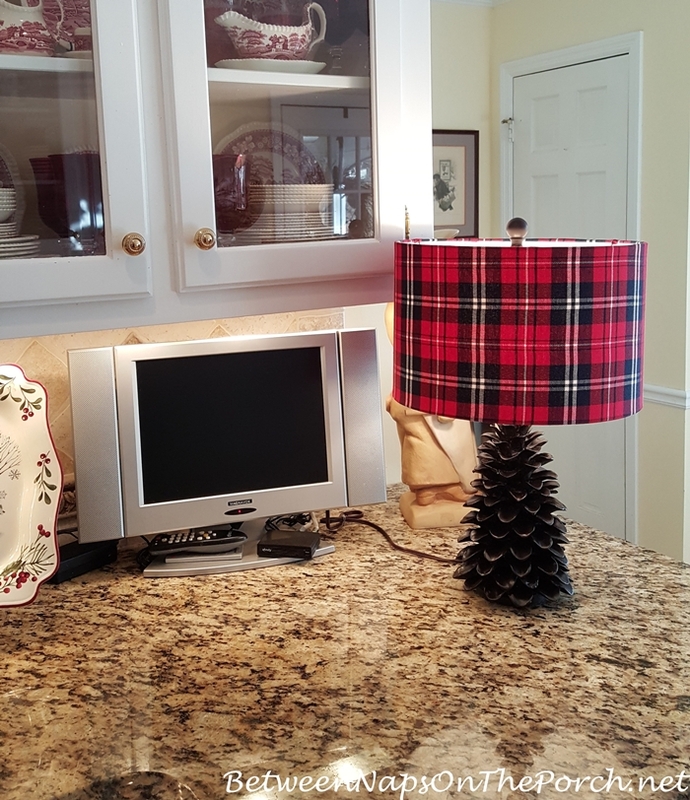 Since price is so low for this darling pine cone base, if plaid isn’t straight, just toss the shade and buy another one (great prices at TJM, Marshalls, etc) and cover in tartan fabric of your choice. I have a problem with plaids that don’t match also, but would not pass on this cute lamp. I’ve always enjoyed using lamps in my kitchen/breakfast room as the ambiance is always fantastic. Of course, task lighting is always a must have but at other times, the lamps are great!! I agree…the base is worth what it cost, even if the shade had to be redone. Barbara, you are so right…they create such a lovely ambiance that you just don’t get with overhead lighting. I am 100 miles from a Home Goods 🙁 That lamp is adorable. Being the tartan lover that I am, this is on my wish list now! Sorry, Susan…I wish they had an online store. They need to build a location in your area! This year they got in two new salad plate patterns. They also sell it online but I can’t find it now. Not sure if it sold out online or not. Thanks! Hope you have a wonderful Christmas! After seeing your platter displayed, I am so glad I kept mine that I purchased earlier in the season. I had considered returning it due to storage place and it seemed a little fragile. A great buy for $12! No, it’s from Walmart. Walmart has been carrying this pretty Better Homes and Gardens Christmas dishware for the last 3 years around Christmastime. I can’t remember now if it has a pattern name but it’s by Better Homes and Gardens. You can see some of the salad plates they had in these three posts: https://betweennapsontheporch.net/christmas-table-setting-tablescape/ https://betweennapsontheporch.net/a-christmas-table-setting-inspired-by-nature-themed-dishware/ https://betweennapsontheporch.net/christmas-table-setting-glitz-and-glam-with-a-touch-of-whimsy/ This year they got in two new salad plate patterns. They also sell it online but I can’t find it on their website now. Not sure if it sold out online or not. They did have the platter again this year, I saw it while shopping in there about a month ago. It’s super reasonably priced…hopefully they will continue to carry each year. Check a Wally World near you and you may still be able to find one. I love a lamp in a kitchen, as well. It adds a cozy ambiance. 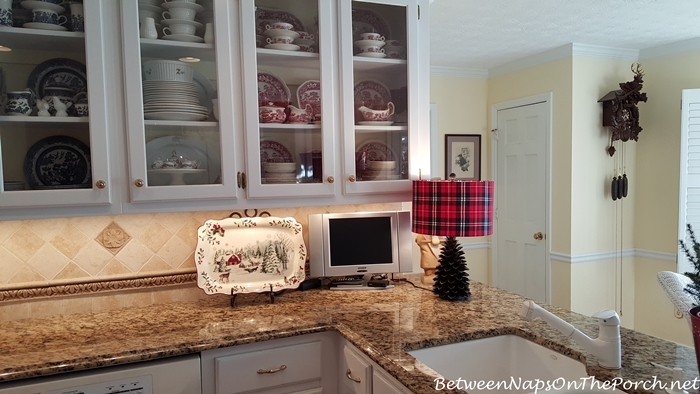 The tartan/pine cone lamp you found is perfect for your kitchen! 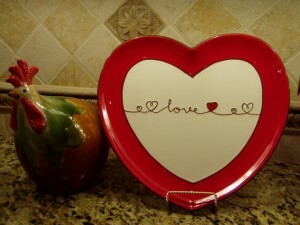 I also love the platter you have displayed. Could you share the pattern with us? The platter is from Walmart. Walmart has been carrying this Better Homes and Gardens Christmas dishware for the last 3 years around Christmastime. I can’t remember now if it has a pattern name but it’s by Better Homes and Gardens. It looks very pretty! But I need to ask where your boxwood wreaths are? You inspired me to hang them on my glass cabinets and I love them! I love that lamp! Funny, I just replaced a lamp in my kitchen from when we first moved in…it had a light yellow/orange glass base with a light orange shade…sounds horrible, but actually looked ok! (It’s cheapness and fact that it fit under the cabinets sealed the deal.) I bought a new gray glassed base with a silvery shade at Target. I am not sure the silvery threads will transition well after the Holidays, but am going to try it! If not, I will rotate out the shade for a less glam one! Anyway, that was my Holiday lamp purchase, just on a more neutral note. I love lamp light as opposed to overhead too! Love the look….just reading this early Saturday and feeling I have to go to HomeGoods ! I always have a lamp in my kitchen – made one from a wine bottle from a favorite winery and have it with a burgundy/red shade on the counter where my wine rack is located. Love the cozy feel when all the other lights are off…like in your photo. Switch it up for the holidays with a Christmas wine bottle with Santa on the label…” Chateau St. Nicholas” – and I have the lamp on a timer so when I come home and it is already DARK AT 4 PM! the kitchen feels cozy. Thanks for the great posts always…hoping to get a blog started in the new year so I can post photos and join the Tablescape Fun ! All the best to you for a very Merry Christmas! OK…I’ll bite…where did you get THAT platter from? It’s from Wally World (Walmart). It’s from that collection of dishware I’ve used in other table settings over the years. 🙂 I saw them in the store this year, too. Love you web site! Please tell me about the TV in he kitchen. I have been looking for years for a small one. I just ran down to see what brand it is. I’ve had it so many years, I’ve forgotten. I can’t believe hasn’t croaked by now but it still works fine. It’s a Magnavox. It replaced a TV that was small and fit under the counter, but was the old style that was so fat. It took up the whole corner and stuck way far out. I like this one because because it’s flat and doesn’t take up any room on the counter. I know it wasn’t very expensive but can’t remember where I bought it now. I bet you could find a good one at Target or Best Buy. Love it with your dishes! Looks great in your kitchen! Great lamp! I also love that platter on the kitchen counter in the stand. What is that china pattern? It’s from Wally World (Walmart). It’s from that collection of dishware I’ve used in other table settings over the years. I saw them in the store this year, too. Would you believe my local Home Goods Store has putt one of the tartan plaid lamps on hold for me till tomorrow afternoon after church? It was late when I called and the manager was so nice when I explained about your blog post and the lamp!!!! 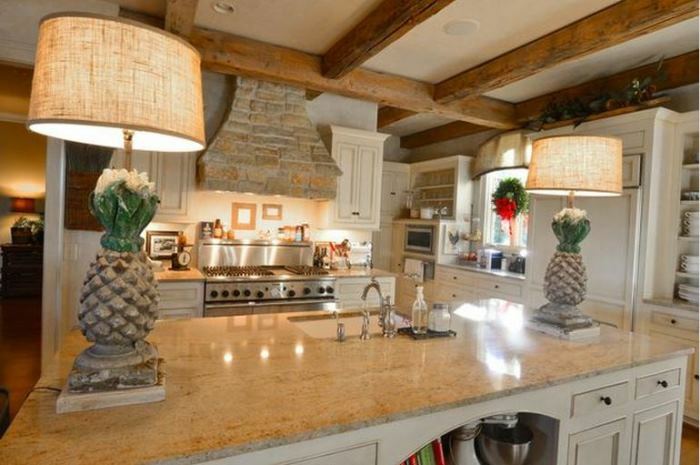 So I will be the proud owner of that very plaid lamp which will be perfect in my kitchen. My cabinets and color scheme are almost identical to yours just by chance mind you, I’m not a stalker, so the splash of red will go along with my total look!!!! Thanks so much!! Now I need a little help…I think I recall a post a while back where you linked the measuring scoops in your canisters.. I meant to jot it down but didnt. Could you please point me in the right direction? I desperately need new scoops and I love the look of yours. You may be able to find them in other places online too. Just perfect, comfy, warm, welcoming and christmasy. 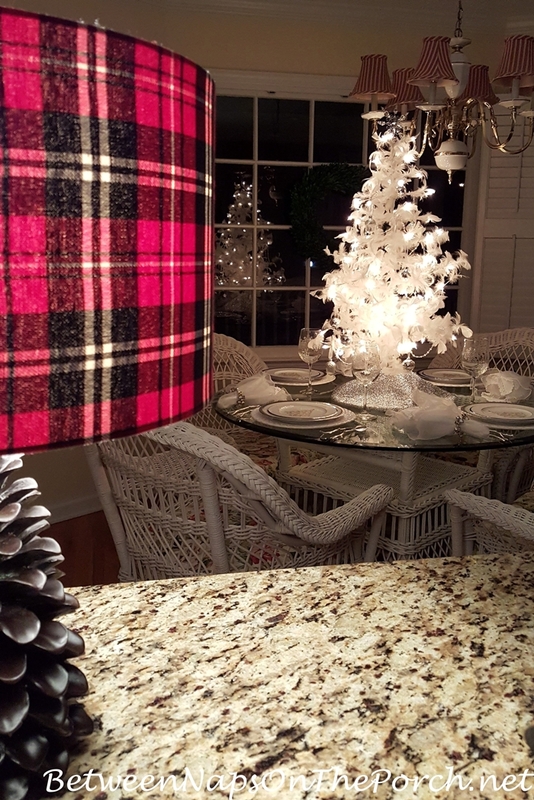 Love plaid and pine cones, a perfect combination. Oh my we don’t have Home Goods here, but we do have Homesense. Linda, I don’t think it came with a label…just a price sticker. That’s the only thing I remember seeing on it. I love using lamps in the kitchen. I have found some at Cracker Barrel, of all places. I have one with a black and white check stained glass lamp shade, and one on my bar that has a stained glass palm frond shade. ( I live in Fl) I love your pine cone tartan one, but the seamstress in me wonders how hard would it have been to match the plaid on the seam on the shade? That sort of thing, that other people wouldn’t even notice, bugs the heck out of me! lol I so agree! I was wondering if maybe the fabric is applied by machines or something. Oh, it’s amazing the cool stuff you can find in Cracker Barrel. I love wondering around in their store and checking it all out. I was afraid of that. That night in the store, I kept having folks coming up to me to ask where they were. I knew they would all go quickly. If you don’t find one this winter, check next fall because every once in a while, they will get something in, two years in a row. 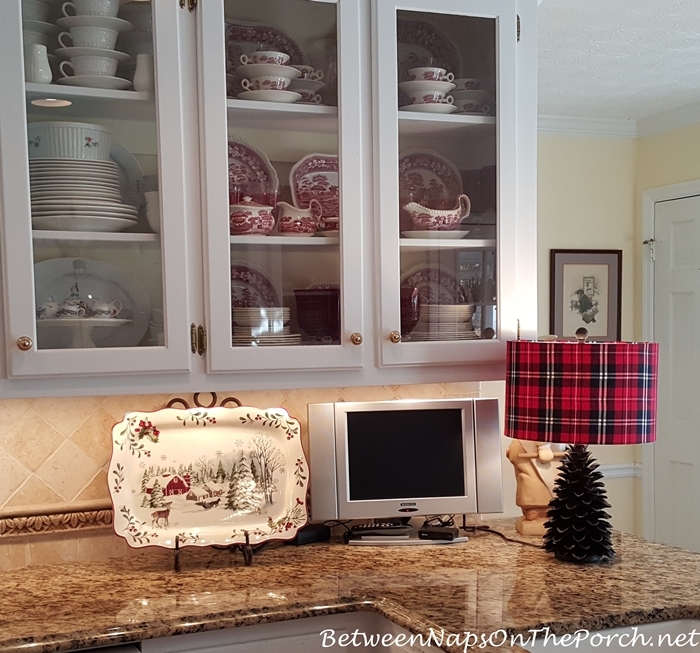 I love the tartan/pinecone lamp ! Also, love the platter, I received two sets of these Better Homes And Garden dishes, plus all the accessories as a Christmas gift this year !!! I got the platter, too. But, I’m having a terrible time finding a plate holder to use for this large piece. I was so sure Hobby Lobby would have what I was looking for.. alas no. May I please ask where you obtained yours ? I’m not much of a shopper. Thanks, Debbie! 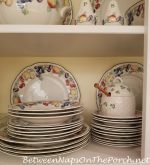 Don’t you just love those dishes, I love the pattern. I’m trying to remember where I bought that. I’ve had it so many years, I’m not sure. I think I may have purchased it in Home Depot Expo before they went out of business. It also works great for holding a cookbook open. If I see any online or while shopping, I will let you know. I’ve just had it for so long, I can’t remember now where I found it. Where do you buy the pine lamp with the plaid shade? Just wanted to let you know I too fell in love with this lamp and purchased it right after Thanksgiving at Home Goods. I have mine in our Family Room sitting on top of an antique radio/ record player looks stunning. I found this lamp on the curbside along with many other items.. some one had just put it on the street to be picked up!! I screamed; slammed to a halt and found someone’s trash was my treasure!! I am in love ♥️ and it has a place of honor in my living room!! Adorable! I’m mad about plaid!! Thanks for posting; i had no idea!! It looks sorta vintage to me!! Yours is hands down my favorite blog! I love you post links to purchase products! Can yo please tell me where you found the other 2 lamps sitting on your counter?